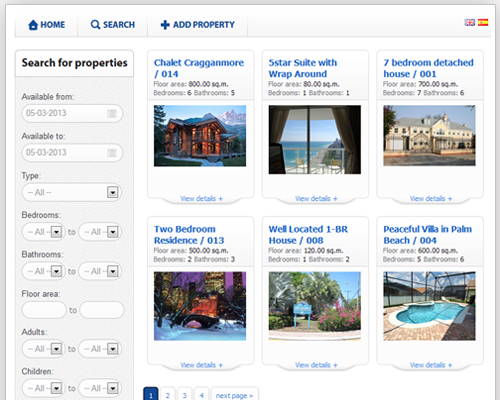 Easy-to-use yet powerful content management system to operate a vacation rental classifieds website. A simple property management software that makes it easy for anyone to add/edit and further manage dynamic vacation rental lisitngs, content and booking functionality. Use the Vacation Rental Script to build your own multilingual holiday rental website and empower your business with a tool to manage property listings content, reservations and users, website functionality and features. No programming knowledge is required. You have full control over property classifieds, front-end titles and buttons, homeowners submissions and users, as well as guest reservations, languages and more. Stivasoft vacation rental software has an intuitive admin interface and provides numerous customizing options, from customizing the design layout to managing SMS / email notifications. Moreover, with Vacation Rental Script you can install property management software on any website and customize it according your requirements and needs. Stivasoft offers Vacation Rental Script with a developer-friendly licence which comes with the full PHP Source Code and the ability for you to make modifications to the vacation rental software. SEO URLs, SEO Meta and ALT tags admin controls, user level access, reservation management, advanced gallery options, such as cropping and resizing images, adding a watermark and more. Manage all aspects of the vacation property listing content, including extras and features, images, seasonal prices, Google map and owner contact details. Vacation Rental Script has multi-language module which allows you to easily handle multiple translations for both the admin panel and the front-end. All translations, titles and system messages can be edited from the vacation rental software admin. Availability calendar and a reservation form is included on the front-end. One-time fee, regular updates, & FREE installation support! Car dealer script for managing content on auto classifieds websites and online car dealership. Through a simple back-end interface you can manage car ads, listing pages, user level access, etc. Full Source Code, regular updates & FREE installation!